One of our Tivos (Tivoes? Tivii?) went out last night, right in the middle of an episode of iZombie on Netflix. One second we were watching Liv feast on a delectable dish of brains au gratin, and the next we saw that ridiculous Tivo emoji-guy and the dreaded "One moment while Tivo restarts" message. We all know that one Tivo minute is equal to two trips around Saturn, and indeed, the message never disappeared and the Tivo never restarted. Fortunately, our Plan B kicked in flawlessly and in a minute or two we were finishing the ep via Apple TV. 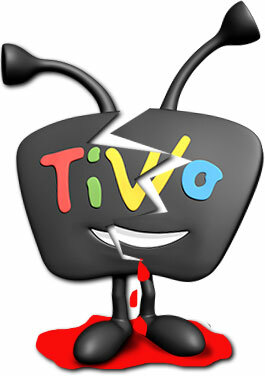 Plug the Tivo back in. Of course, that didn't work, so we were reduced to the Nuclear Option: calling Suddenlink user support. That turned out to not be a horrible experience, but the tech was unable to reboot the unit remotely and we scheduled a service call for next week. My guess is that we'll get a new unit. In the meantime, the prospect of having no TV in our living room was giving half our household the heebie-jeebies, so it was up to me to come up with an alternative. Should be pretty simple, right? Just disconnect the cable from the Tivo, reconnect it to our A/V receiver, and - voila! - wasteland recaptured. Guess what? Our four-figure-cost A/V receiver doesn't have a coax input. That would be too low-tech; it's HDMI or bust. Wait! I'll just route the cable through our Blu-Ray player and...well, rats. No coax input there, either. Looks like I'll have to bypass the receiver and connect directly to the TV, meaning that we can't watch Telenovela in 7.1 surround sound. No big deal. It's not a cosmetically pleasing solution, because it means that a length of cable will be draped across the mantel - because, of course, the coax input is on the opposite side of the TV - but it's only temporary. The cable is not long enough. I'll have to find another length of coax, plus a connector, to make the reach. Fortunately, I never throw anything away, other than receipts that the IRS stupidly deems critical, and I'm able to come up with both components. TV is now connected. All I have to do is put it on the right input. And...the TV remote's batteries are dead. Because, of course, we always use the Tivo remote to control things. Off to search for AAA batteries. Fortune smiles upon us again; we always stock up on batteries around Christmas. So...TV connected to cable? Check. Input switched to cable in? Check. Fixer Upper appearing on TV? Uh, negatory. We have to "reacquire" the active channels, a process which is apparently an unholy combination of medieval mysticism and Star Trek technology. You can almost hear gears cranking inside the TV - slooooowly - as it grinds through 300 channels to locate and electronically anchor the three that we usually watch. It was a process only slightly less painful than a root canal, but we have again have a working TV in the living room and we can get back to the important work. Those iZombie episodes won't watch themselves, you know. This page contains a single entry by Eric published on January 2, 2016 1:13 PM. 30 Years of Persistence was the previous entry in this blog. Newsflash! Mother Nature Inexplicably Thwarts Man's Best-Laid Plans is the next entry in this blog.